These are two suitcases of vacation Bible school supplies to be used at the orphanage in Manali, India. The funds for these items were donated by the people and friends of New Hope Community Church. 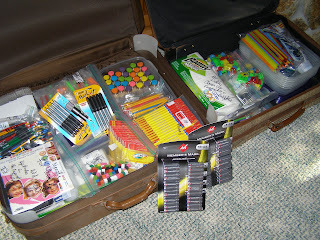 I also have a third suitcase with items for the children and their caregivers donated by my students and friends. Today, my dentist office donated 96 tubes of toothpaste. Thank you Dr. Johnsen and staff! In addition to our own personal suitcase, each of us will be able to bring a suitcase full of donated items and vacation Bible school supplies. Because there is a 50 pound weight limit on suitcases, we need to be as efficient as possible. Tomorrow night, Tuesday, the 18 of us going on the trip will meet in Grand Rapids to have a Packing Party. We will bring suitcases (that will stay in India) and all the items we have received as donations. We will pack, removing items from packaging that adds weight and takes up space. We will distribute the items in various suitcases so that none of them exceeds 50 pounds. Please continue to pray for us. This trip starts in 3 days and there is much to do: packing, finishing work and school, leaving families, finalizing lesson plans and making sure that all materials needed for those lessons are in the suitcases. It promises to be an exciting trip. I am thankful for your prayers and I hope you enjoy taking this journey with us.